Ng, J. L., Truong, T. T., Hocart, C. H. and Mathesius, U. (2016). Quantifying Auxin Metabolites in Young Root Tissue of Medicago truncatula by Liquid Chromatography Electrospray-ionisation Quadrupole Time-of-flight (LC-ESI-QTOF) Tandem Mass Spectrometry. Bio-protocol 6(12): e1843. DOI: 10.21769/BioProtoc.1843. Auxins represent a major group of phytohormones controlling plant development. The spatio-temporal regulation of auxin gradients is essential for the initiation, growth and correct development of plant organs. Because auxins and their metabolites occur at trace levels in plant tissue, experiments requiring identification plus their selective and specific quantification can be most conveniently achieved using mass spectrometry (MS) and the associated chromatographic methods. With the advent of appropriate liquid-based ionisation techniques, emphasis has moved from the use of gas chromatography as the sample interface to the MS (GC/MS), with its concomitant need for derivatisation, to the more sensitive liquid chromatography tandem mass spectrometry (LC-MS/MS). We describe an optimized liquid chromatography electrospray-ionisation quadrupole time-of-flight (LC-ESI-QTOF) methodology for the quantification of auxins. While the solvent extraction of young Medicago truncatula (M. truncatula) roots, as described herein, is relatively straightforward, older, woody or oily plant tissues may also be analyzed with appropriate modification to remove interferences and/or enhance extraction efficiency. In our hands, the analytical assay has proved sufficiently sensitive for the quantification of auxins to investigate their roles in various organogenic events, such as root nodulation in M. truncatula. Further increases in sensitivity can be expected with the use of the latest generation of instruments. Note: Currently, it is “VWR International, catalog number: ODGHPC35”. Note: It is also named “Indole-3-acetic acid (indole-D5, 97-98%)” on Cambridge Isotope Laboratories website. Solvents and chemicals should be of the highest available purity. Auxin standards and internal standards are prepared in HPLC grade methanol. 1,000 mg/L stock solutions are prepared using acid washed volumetric flasks and aliquoted (1 ml) into 2 ml amber glass vials with crimped caps and stored at -80 °C until use. To investigate the early stages of nodulation, a 4 mm segment around the inoculation site (not including the tip) is harvested. To determine auxin concentrations in nodules, whole root nodules are harvested. To measure the total root auxin concentration to compare between plant genotypes, species, etc., whole root tissues are harvested. M. truncatula roots are excised, collected in sterile, non-autoclaved 2 ml Eppendorf tubes and immediately snap-frozen in liquid N2. For auxin quantification in M. truncatula roots, 50-100 mg of tissue is sufficient. Frozen root tissues are crushed with stainless steel balls in a TissueLyser LT with a pre-cooled sample holder (stored at -20 °C). 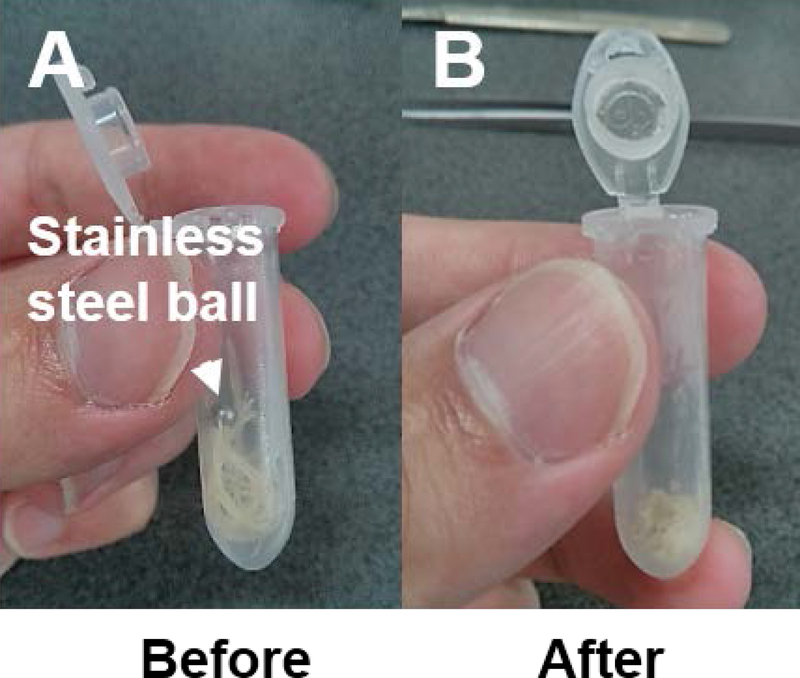 The stainless steel balls are left in the 2 ml Eppendorf tubes throughout the solvent extraction protocol. The TissueLyser LT frequency is set no higher than 40-45 Hz and for one min to sufficiently grind the young root tissue. Extended time may be necessary for tougher and/or older tissue. It is pertinent that the tissue is completely ground to maximize the solvent extraction efficiency for auxins (Figure 1). Figure 1. An example of Medicago truncatula root tissue before and after grinding by a stainless steel ball in a TissueLyser LT. Complete grinding of the tissue is essential for optimal metabolite extraction (i.e., tissue should be of a powder consistency). 20 ng of the internal standard (D5-IAA) is aliquoted to each sample and allowed to be absorbed by the root sample matrix (samples are always kept on dry ice). To add 20 ng internal standard, accurately pipette 20 μl of 1 mg/L internal standard stock solution to each sample. If dry ice is not available, keep samples on ice. The same applies to step 4. Next, 600 μl of the extraction solvent comprising of 20:79:1 methanol:propanol:glacial acetic acid (v/v/v) is aliquoted to each sample (samples still kept on dry ice or ice) and then vortexed vigorously for 5 sec. Note: The extraction solvent is prepared by measuring volumes of the specified organic solvents above using an acid-washed 100 ml measuring cylinder. The solution is then transferred to an acid-washed 100 ml Schott bottle for safer storage. It is recommended that the extraction solution is made fresh prior to any new batch extraction to eliminate possible cross contamination. Auxin metabolites are extracted in an ultrasonic bath for 30 min at 4 °C. Samples are centrifuged at 16,100 x g for 15 min at 4 °C. The supernatant from each sample is transferred into new, sterile, non-autoclaved 1.5 ml microtubes. Repeat steps 4-6 and combine the supernatant from this second extraction with the first. The combined extract is reduced to dryness in a vacuum centrifuge (30 °C, ~20 min; Figure 2A). Add 100 μl of methanol to each sample tube and then vortex vigorously, ensuring that the methanol comes into contact with the entire inner wall of the tube so that the auxin extract is adequately resuspended prior to transferring the solution to a Nanosep MF GHP 0.45 μm filter centrifugal device (Figure 2B) for sample filtration. An additional 100 μl of methanol is added into each sample tube, vortexed, and the solution combined in the corresponding Nanosep MF GHP 0.45 μm filter centrifugal device. Samples are centrifuged at 16,100 x g for 1 min at room temperature to remove particulate matter that could otherwise block and dirty the LC narrow bore sample and sample lines; ESI nebuliser and chamber; and the Q-TOF glass capillary transfer line and skimmer. Figure 2. Consumables and equipment used for the extraction and quantification of auxins. A. Vacuum centrifuge used to concentrate the auxin and auxin metabolites in the samples by evaporating off the excess solvent. B. Centrifugal device used to filter samples prior to analysis. C. Amber autosampler glass vials with inserts used for the final resuspension of auxins prior to analysis. D. Agilent 6530 HPLC setup. E. Agilent High Resolution Accurate Mass LC-ESI-QTOF setup. The filtrate (containing soluble auxins) is transferred into amber (to minimise photo-oxidative degradation, as auxins are light sensitive) glass autosampler vials with 250 μl inserts (Figure 2C). Samples are reduced to dryness in a vacuum centrifuge and resuspended at a smaller volume (e.g., 50 μl) of methanol/water mixture (60:40, v/v) prior to analysis. Note: The vacuum centrifuge is set at 30 °C. For a 200 μl mixture, approximately 20 min is required to dry the samples. Extracted auxins are analyzed immediately with the optimized LC-ESI-QTOF (Figure 2D-E). Alternatively, auxin extracts can be dried (freeze-dried or vacuum centrifuged) and stored for up to two weeks at -80 °C under an inert atmosphere (high purity N2 or Ar gas) prior to analysis. The concentrated, resuspended auxin extracts are injected (7 μl) onto an Agilent Zorbax Eclipse high resolution XDB-C18 2.1 x 50 mm, 1.8 μm LC column interfaced to an Agilent 6530 High Resolution Accurate Mass LC-ESI-MS Q-TOF system (Figure 2D-E). Solvent A consists of 99.9% water:0.1% formic acid and solvent B consists of 90% methanol:9.9% water:0.1% formic acid. Auxins are eluted from the column at a flowrate of 200 μl min-1 using the linear gradient described in Table 1. Samples are subjected to electrospray ionisation in both positive and negative ion polarities (greater instrument sensitivity was achieved for IAA, IBA and IAA-Ala in the positive ion mode. Other auxin metabolites were better detected in the negative ion mode). Optimized electrospray ionisation conditions are described in Table 2. The Q-TOF is run in targeted MS/MS mode (developed specifically for quantification purposes) with collision-induced dissociation (N2 collision gas supplied at 18 psi) and a 1.3 m/z (mass-to-charge) isolation window. The Q-TOF is run in an extended dynamic range (2 Hz) with the MS mode set at 100-1,000 m/z at an acquisition rate of 3 spectra s-1, whereas the MS/MS mode at 50-1,000 m/z and at an acquisition rate of 3 spectra s-1 (Ng et al., 2015). Optimized collision energies and signature product ions for individual auxin analytes are listed in Table 3. Note that these auxin metabolites are targeted in our experiments because they were hypothesized to be present in M. truncatula. For the quantification of auxins in other plant tissues, species or to answer other biological questions, additional auxin or auxin-like compounds could also be targeted using this MS/MS acquisition method. Table 3. 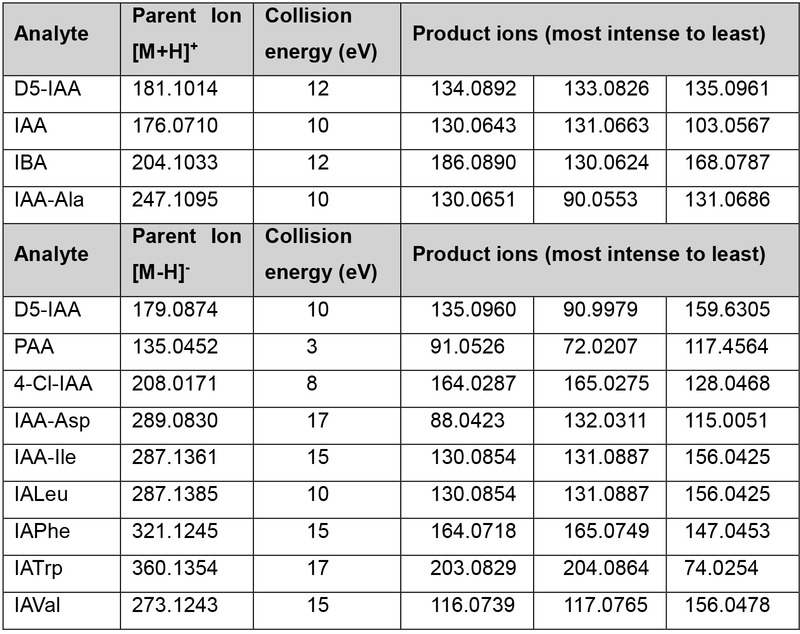 Optimized collision energy and signature product ions for individual analytes in the positive (upper panel) and negative (lower panel) ion modes. Extracted from Ng et al. (2015). Data are analyzed with the Agilent MassHunter software version B.05.00. For each run, authentic calibration and quality control (QC) reference standards with internal standard (D5-IAA) are used for unbiased identification and quantification of auxin metabolites in real samples. The retention time, precursor and signature product ions of authentic standards are used to confirm putative positive hits in real samples. An example is given below in Figure 2 (using Extracted Ion Chromatogram (EIC) in the MassHunter software). Authentic standards are always run in conjunction with real samples as a quality control check for system performance and to account for any minor change in parameters (e.g., retention time shifts) that might occur between experiments resulting from possible HPLC column batch variation, dirty LC-MS and/or mobile phase preparation. Note: The auxin QC standard mixture is prepared with all auxin compounds at 1 mg/L and internal standard at 0.4 mg/L. The auxins and auxin metabolites would ideally be quantified against their own stable isotope (e.g., 13C- or 2H-labelled internal standard). However, these are often either not available or prohibitively expensive. While not yielding ideal, absolute quantitative values, the use of a related internal standard (in this case 2H5-IAA), will readily enable quantitative comparisons between different samples. The auxins and auxin metabolites are validated over a calibration range (Ng et al., 2015) with the internal standard fixed at a known concentration. Calibration curves are graphed for each analyte to derive linear regression equations and correlation coefficients for quantification, and to ascertain their respective limits of detection (LODs) and lower limits of quantification (LLOQs). 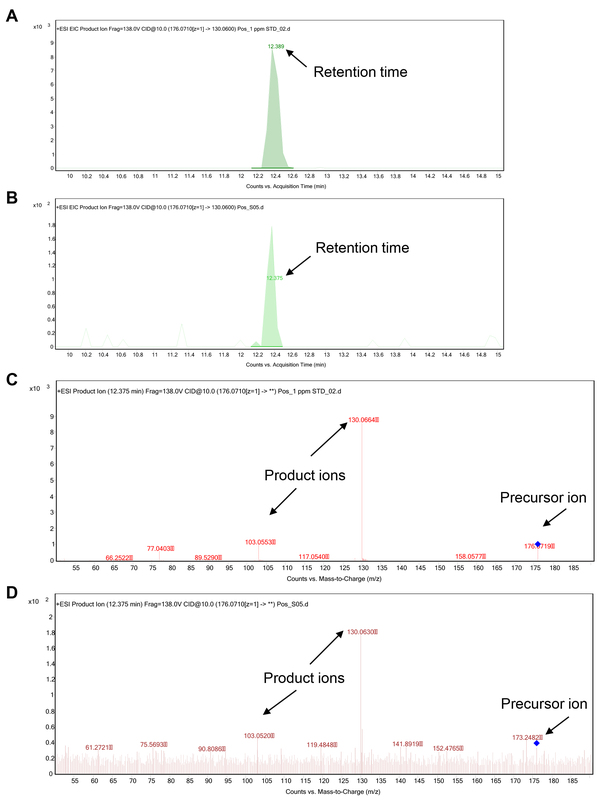 The extraction ion corresponds to the most abundant product ion (quant ion) for each analyte (see Figure 3). The peak area is divided by extracted quant ion peak area for the internal standard to obtain an area ratio. 20 ng is the concentration of the internal standard added to each root tissue sample. Concentrations are reported on a fresh weight basis, but can also be expressed as dry weight if necessary. Figure 3. Identification of IAA in a Medicago truncatula root sample. Authentic IAA standard (A, C) is used as a reference to compare with a putative IAA hit in a real sample (B, D). The retention time of the IAA compound identified in the sample (B) is close to that of the standard (A). The precursor and product ions of the putative IAA compound in the sample (D) closely match those found in the authentic IAA standard (C). The fragmentation product ion m/z 130.06 is used as the quantification (quant) ion as it is most abundant and the other signature product ions are qualifier (confirmation) ions. This protocol was adapted from Müller and Munné-Bosch (2011) and Buer et al. (2013) and was performed by Ng et al. (2015). This work was supported by an Australian Research Council Future Fellowship awarded to Ulrike Mathesius (FT100100669). Buer, C. S., Kordbacheh, F., Truong, T. T., Hocart, C. H. and Djordjevic, M. A. (2013). Alteration of flavonoid accumulation patterns in transparent testa mutants disturbs auxin transport, gravity responses, and imparts long-term effects on root and shoot architecture. Planta 238 (1): 171-189. Muller, M. and Munné-Bosch, S. (2011). 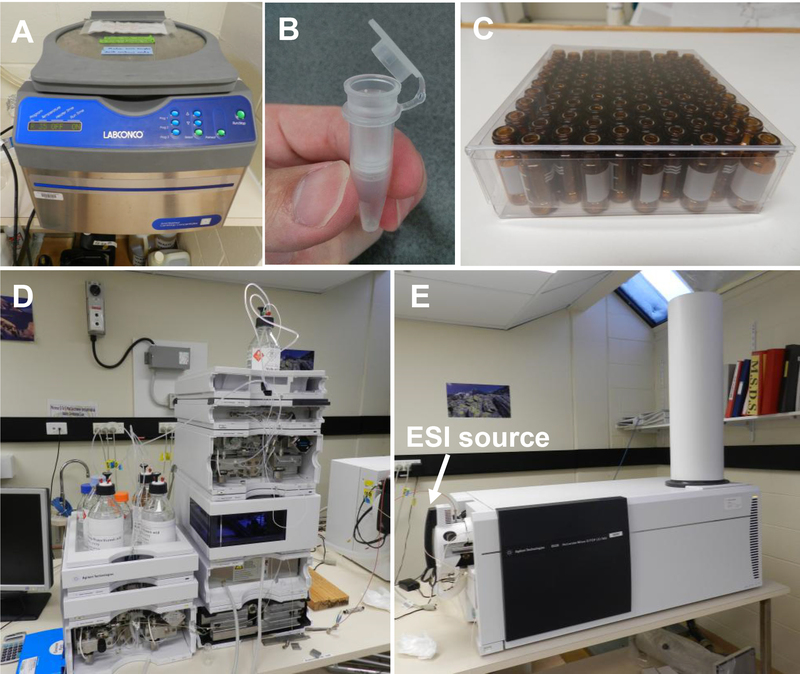 Rapid and sensitive hormonal profiling of complex plant samples by liquid chromatography coupled to electrospray ionization tandem mass spectrometry. Plant Methods 7: 37. How to cite: Ng, J. L., Truong, T. T., Hocart, C. H. and Mathesius, U. (2016). Quantifying Auxin Metabolites in Young Root Tissue of Medicago truncatula by Liquid Chromatography Electrospray-ionisation Quadrupole Time-of-flight (LC-ESI-QTOF) Tandem Mass Spectrometry. Bio-protocol 6(12): e1843. DOI: 10.21769/BioProtoc.1843.